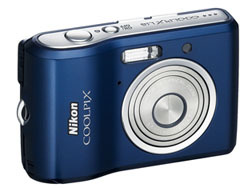 The Nikon Coolpix L16 is a new compact and affordable 7 megapixel digital camera. The Nikon L16 features a 3x zoom lens, large 2.8 inch LCD screen and new Easy Auto Mode. New COOLPIX L-Series offer ease of use and extra-large LCD-screens. The user-friendly COOLPIX L-Series cameras offer high resolution, large LCDs and 3x optical zoom for excellent value. Amsterdam, the Netherlands, January 29, 2008 – Nikon Europe today launched the newest member of its successful COOLPIX Life-Series, the L16 compact digital still camera. The L16 is affordable, compact and easy to operate. The L-Series cameras deliver great close-ups, find faces and fix red eyes automatically to help everyone create beautiful images. The COOLPIX L16 offers 7.1 effective megapixel resolution and a 2.8-inch wide-angle LCD screen. Like the L18, it has a 5.7-17.1mm lens with a 3x optical zoom, with an aperture range of f/2.8-f/4.7. Both L-Series models feature simple, accessible designs with dedicated Shooting and Playback mode buttons. With the Easy auto mode, the user can simply turn on the camera and shoot without worrying about settings. The camera can even detect individual or multiple faces in a group, then focus and zoom in to make a perfect composition. If required, focus and zoom can also be steered manually with the convenient multi-selector and zoom controls. The L16 is available in silver or matt black and has an internal memory of 16MB and a slot for a SDHC memory card. Both cameras utilise Nikon’s innovative high-performance EXPEED digital image processing. The L-Series cameras also feature face-priority auto focus, which quickly detects and focuses on up to 5 faces at once. In addition, the light falling on faces is measured producing a more natural result. Additional innovations include anti-shake auto exposure which compensates for camera movement, avoiding blurred results by increasing shutter speed and sensitivity. The L Series also features In-Camera Red-Eye Fix, which analyses each image and automatically finds and corrects any accidental red-eye, and D-Lighting, which enhances underexposed images. The L16 is supplied with two AA batteries, a USB cable, audio video cable, a strap and Nikon’s Software Suite CD-ROM for COOLPIX. A battery charger, rechargeable Ni-MH batteries and AC adapter are available as optional accessories. The L16 measures 95 (W) x 61 (H) x 29.5 (D) mm, and weighs approx. 125g (without battery and SD memory card). This entry was posted in Nikon and tagged Coolpix, Nikon on March 6, 2008 by jonathanb. Cool camera, easy to use. Those who like to point and shoot will be happy with this camera.